You are here: Home / Cat Behavior / Did My Cat Get PTSD From Being Spayed? My almost 1 and a half year old female cat was spayed about 8 months ago. Since her surgery she does not like to be touched. She shows her love by rubbing on our legs and following us around (such a sweet girl) but when we try to pet her she crouches her back down and walks away. If she is laying down and we try to pet her she will get up and move. I have read that some cats do not like the feeling of being petted and we have learned to respect that and to not do it, but this behavior only started after being spayed. Vets say online that cats’ behavior usually does not change after surgery but I beg to differ. I am worried that she has some post-traumatic issues from associating hands with pain now because of her surgery or that someone in the mobile clinic hurt her (hit her). Any idea if this is possible and how we can show her that she does not have to feel afraid of hands? Thank you. Thomas: Well, John, it’s quite possible for cats to be traumatized by having surgery, even if it’s nothing the vet or anyone at the clinic did. Some kitties are just more sensitive. My beautiful snuggle-buddy, Dahlia (oh, how I miss her! ), used to love the vet, but after she was spayed, she never even wanted to get in the carrier again! Bella: We cats can develop a version of PTSD. Please note that we are not at all making light of the suffering of humans who have PTSD from experiences in war or traumatic experiences in childhood and adulthood! We’re just saying that our brains have the same kinds of chemicals that work in the same ways, and so cats can react behaviorally to trauma. 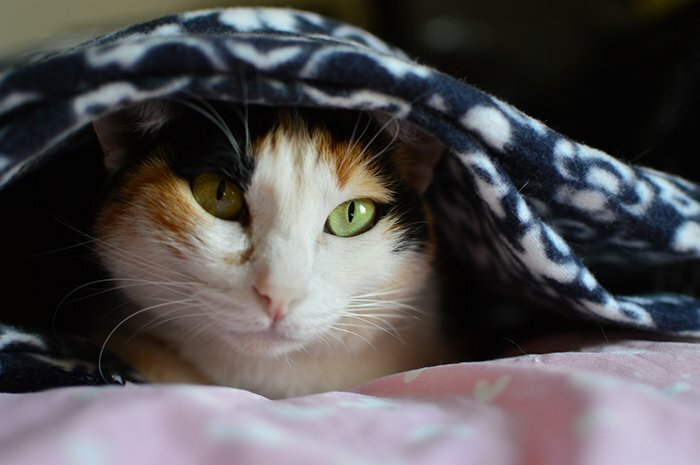 Tara: And keep in mind that even though it’s the right thing to do to have your cat spayed or neutered, some cats have a hard time with the strange environment and the pain they experience after their surgery. I was spayed at a community clinic–I even have a little “S” tattooed on my tummy so that anyone who finds me will know I’m spayed! Thomas: It’s also true that no matter what people say, some cats’ behavior does change after being spayed or neutered. For most cats it’s a pretty easy experience, but for some like your cat, who are more sensitive, the surgery can be a traumatic experience. Bella: For the record, there’s a 99.5 percent chance that nobody deliberately hurt your cat while she was at the clinic. But sometimes inadequate pain management (abdominal surgery hurts!) or the sounds and smells of other cats could certainly have caused trauma and the resulting PTSD-like symptoms. Tara: So, what can you do about your cat’s PTSD? The answer is primarily “be patient.” But there are some things you can do to help her realize she’s safe with you again. Thomas: The first thing is that you want to get her feeling more comfortable in her home. The best thing you can do to help her with this is to use a plug-in pheromone diffuser. These are often marketed as tools to help stop inappropriate urination, but the “happy cat” pheromones they release can help a stressed-out cat, too. Simply plug in the diffuser in the room where she hangs out the most–and/or in a room where you and she spend time together. You can buy them at pet stores, in some vets’ offices, and online. Bella: The next thing you’ll need to do is positively reinforce her when she’s close to you. For example, have some of her favorite treats available, and when she sits next to you, give her a treat. That way, she’ll start learning that good things come from your hands. Tara: But remember when you’re giving treats that they do have calories, so you’ll want to adjust your cat’s regular food intake to account for the extra calories in the treats. Bella: You should talk, Tara! You’re certainly not starving! Tara: That’s mean! *sniffle* I’m not fat, I’m cobby! Thomas: Bella, be nice to Tara. Thomas: Anyhow, as we were saying, treats can be a great positive reinforcement to remind your cat that your hands are friendly hands, and they’re not going to sweep her into a carrier for a trip to get cut open and sewn up. Bella: Another thing you can do to get her interested in you is to play with her. Play not only strengthens the bond between person and cat, it builds the cat’s confidence. We love playing with a “thing on a string,” which some people refer to as a fishing pole toy. That kind of interactive play is super-fun, and all cats should enjoy it on a regular basis. Tara: And then you can do what Mama did with her cat, Maddy Gold, way back when Mama was still a kitten herself. Maddy was kind of like me: she was a tuxedo cat and she was really, really scared. She even hid under the couch like I did when I first came here. Basically, she too had PTSD. Thomas: What she did was open a can of cat food and put it under the couch where Maddy was hiding. Then, when Maddy took a bite of the food, she moved it just a tiny bit until it was not quite under the couch. She kept doing this–moving the cat food can just a few inches at a time–until Maddy was right in front of her. Then she reached out, ever so slowly, and gave Maddy a gentle pet on her head. Bella: Maddy jumped back a little bit, but then when she realized that all Mama wanted to do was give her some love, she hopped into Mama’s lap, curled up, and started purring. Mama says she cried happy tears when that happened. Tara: And after that, Maddy was practically her shadow. She slept on Mama’s bed, got on her lap while she was doing homework, and all kinds of stuff. Kind of like me. Now that I know I’m safe and I have a forever home, I love hanging out with Mama. I even sit on her chest when she’s playing Computer or watching TV. And sometimes I even sleep on the bed with her and Thomas and Bella. Thomas: Ultimately, John, it’s going to take patience and compassion to help your cat resolve her PTSD. Treats, play, and doing things like feeding her only when you’re nearby will help her to understand you love her and you’re not going to hurt her. Bella: If you free feed, we recommend that you move to a timed feeding schedule. That way she’ll know you’re the source from which all food flows, and that too will strengthen your bond. Tara: Best of luck to you and your cat. 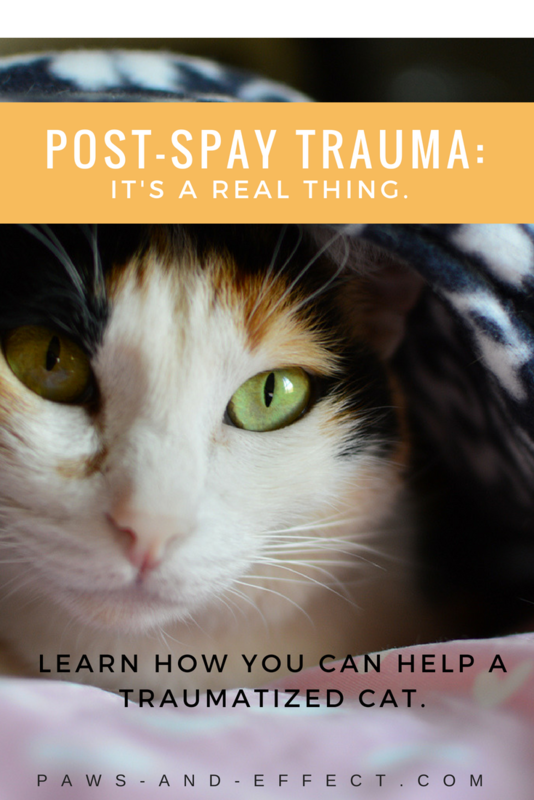 And regardless of the fact that your cat has PTSD from her spay experience, it was the right thing to do. A spayed or neutered cat will be happier because they’re free from the hormones that drive them crazy with the desire to reproduce. “Fixed” cats also live longer because they tend to roam less and because once their reproductive organs are removed, there’s no risk of developing cancer in those organs. Why is my spayed 15-year-old cat acting like she's in heat?